Let’s imagine for a few minutes. Imagine that you are standing in front of a full length mirror. You can, of course really look into a full length mirror if that is more helpful, but not necessary. Now, what do you see? “Well duh, I see myself looking back at me,” you say. Keep looking. 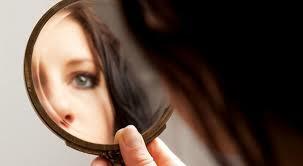 After the obvious reply, what are the little voices inside your head saying as you continue to stare at yourself? I’ll tell you what mine would say. First they would say, “Hmm not half bad for an old broad.” But then as I continue to stare other comments will surface. “Is that a gray hair I see? Man, I look tired. God, is that another wrinkle?” And on I go as I scan down my body. I start to critique my image. But by what standard do I base my assessment? Now think about what media you use on a regular basis. If you only read newspapers or watch the news, you may consider the information your subconscious is collecting to be only factual and your mirror may reflect a harsh reality of life because let’s face it, most current news is grim. If it bleeds it leads. If you watch a lot of television than your mirror reflection may be slanted towards clean cut images of beautiful people who do good and shadowy, dark or dirty biker type images that do bad things. A very narrow view of what our world is, in fact really like. And if you are addicted to social media the image of yourself that you see reflected in that mirror may be based on trending hot topics. Do you even come close to looking like Kim Kardashian? Do you feel out of touch because it took you two days before you saw the latest viral video, you know the one all your Facebook friends are talking about? We reflect what we see. This concept was cemented into me recently while I was spending a lot of time surfing several social media sites. I belong to several groups on Facebook and LinkedIn as well as some other special interest sites and I was letting them color my perception of myself. I originally signed up for these groups for support from like minded people who promote the same perspectives as I do. Birds of a feather flock together and all that. I am in the process of re-branding my blog site and I wanted to see what other people who have similar sites have done. I was looking for inspiration but instead I became overwhelmed. As one of my Facebook friends says, I began to compare and despair. I had a little pity party and my ego had a field day as it bathed in all the self doubt I washed over myself. Thankfully I recognized this old standard and shut it down. I also shut down my computer. What was I thinking. I do not want my site to reflect what everybody else is doing. I want it to reflect what I am doing. I want my blog to be my authentic voice and cast an image of my slant on life. In order to do that I have to use another mirror. One that reflects the likeness that is truly and uniquely me. Have you stepped off your path somehow and found yourself temporarily lost? Are you at a crossroads and don’t know which road to take. Maybe you are experiencing Deja vu and life is reflecting the same old tired images. Then it is time for you to shut down the monitors of the outside world that are currently holding your attention and do some inward reflecting. That is the only way you will be able to quiet all the voices and images of the never ceasing collective consciousness that is our world today long enough to get a clear image of the one and only true mirror you will ever need and that is yourself. Gaze upon the images in your mind. Listen to that inner voice. The information that you receive, the opinions and ideas that resonate out from your intuition and your minds eye are the best and only mirror you need to reflect on. Love this, so true. Can’t wait for part 2. Thank you. Thanks for the kind words Masha. Part 2 is already written because I wanted some time to focus on re-branding my blog with out switching up thought patterns. Sometimes you just have to hunker down and focus 🙂 I hope you enjoy part 2 as well.